This thoroughly expanded Third Edition provides an easily accessible introduction to the logistic regression (LR) model and highlights the power of this model by examining the relationship between a dichotomous outcome and a set of covariables. 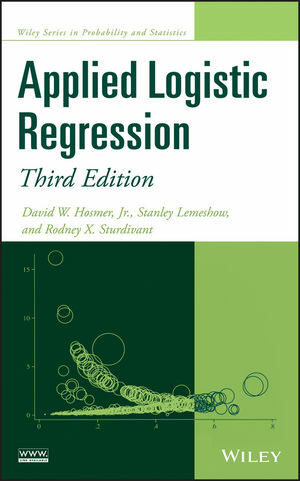 Applied Logistic Regression, Third Edition is a must-have guide for professionals and researchers who need to model nominal or ordinal scaled outcome variables in public health, medicine, and the social sciences as well as a wide range of other fields and disciplines. DAVID W. HOSMER, Jr., PhD, is Professor Emeritus of Biostatistics at the School of Public Health and Health Sciences at the University of Massachusetts Amherst. STANLEY LEMESHOW, PhD, is Professor of Biostatistics and Founding Dean of the College of Public Health at The Ohio State University, Columbus, Ohio. RODNEY X. STURDIVANT, PhD, is Associate Professor and Founding Director of the Center for Data Analysis and Statistics at the United States Military Academy at West Point, New York.